Google has added a list of goodies to their products for those tho are absorbed in the world cup. 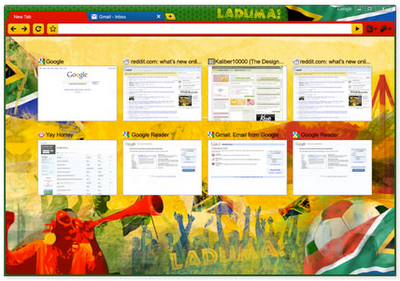 The best among them is world cup themes for your Google chrome browser, comes with a complete world cup-colours cute interface.To allow you to paint your browser in support of your favorite teams, Google has created dedicated a Chrome download and iGoogle world cup themes for each of the 32 teams that are playing. Previous articleWont twitter find a lasting solution?